Your dogs have been wearing them on leashes and collars and now Fleecy Paws brings the Rats and Baa Baa Black Sheep to you, the handler. Rat socks currently available on black soled socks consisting of 95% cotton, 5% spandex on the sole which makes them thicker, softer and breath better. Upper part of sock is 95% polyester and 5% spandex. 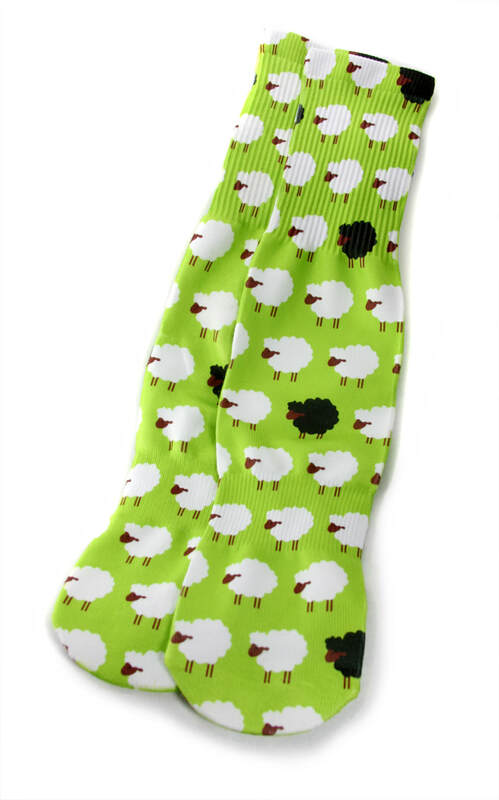 Baa Baa Black Sheep socks are completely printed on both sides on socks consisting of 95% polyester and 5% spandex. Images are dye sublimated for brilliant colors and will not bleed or fade in the wash.
Sock size is Adult Unisex Mid-Crew length and have extra arch support built in.